2017 was mezcal’s coming out party. 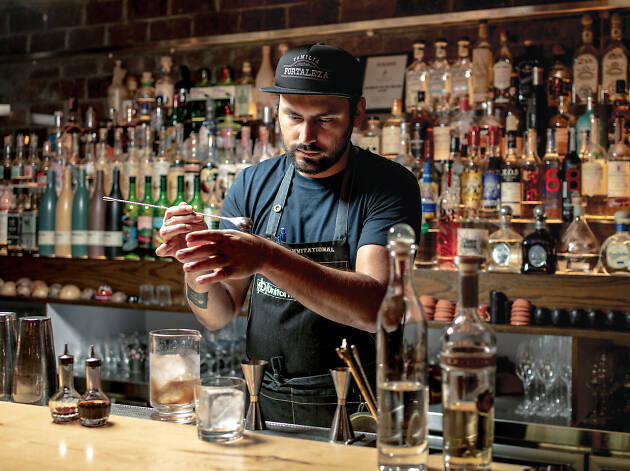 Previously unheralded by our city’s bartenders and tricky to get a hold of, as 2016 closed so Mezcalito opened, followed this year by Los Sotano and 11 Westside. Now comes Coa, offering the most in-depth mezcal menu in Hong Kong. The space itself is nothing out of the ordinary. Brushed concrete walls, filament bulbs – it’s the same industrial chic that’s only offense is its ubiquity. There are 17 pages of the menu devoted to mezcal and almost as many for tequila. For the uninitiated it can be quite daunting. Thankfully, staff are more than happy to explain the differences between a mezcal made with agave angustifolia and one produced from agave convallis. Feeling confidently informed we begin by sampling Mezcaloteca Pechuga de Chino ($158), a mezcal redistilled with chicken and turkey breast hung over the still – the meaty vapours supposedly adding to the spirit’s final flavour. It’s no spurious claim. Served the traditional way in a small vegetable gourd, the classic mezcal flavours are present – the smoky, earthy tones – but there are also notes of umami, demonstrating that the meat successfully completed its infiltration. Impressed, we move on to El Jolgorio Tepeztate ($188), made from a giant agave that takes more than 30 years to mature. There’s only one bottle of El Jorgorio in the entire bar and although far from cheap, this second mezcal is also excellent. The flavour is intense – full of bell peppers and caper berries – but it’s a smooth drink, provoking no recoil. The more you imbibe the more it mellows, giving way to a rich, long finish. We finish off with a cocktail. The Caffeinated Negroni ($100) is a mix of Don Amado Rustico Mezcal, Master’s gin, coffee and infused Mancino Bianco vermouth and Aperol. Good for those who find the standard negroni too harsh, this is a surprisingly smooth variant where the coffee lingers pleasantly in the background. Hong Kong may not be ready for Coa. 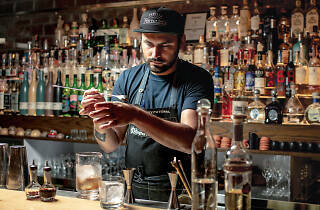 Its in-depth focus on mezcal and tequila is commendable, though whether residents take to it and the high price of certain rare bottles remains to be seen. It would be a shame if it failed because Coa offers something genuinely new in its in-depth approach to mezcal. It’s a spirit of great complexity that deserves greater recognition – and Coa is certainly the best place in Hong Kong to appreciate it. Amazing drinks and great service - had a lot of fun here, the mescal is pretty lethal!